Im Folgenden steht die englische Bedienungsanleitung. Eine Online-Version finden Sie auf der Titelseite meiner Homepage. Außerdem gibt es eine Seite zu Consuls deutschen Verwandten. Wenn Ihnen der Rechenaffe gefällt, können Sie hier auch das Programm Consul für Windows herunterladen (ZIP-File ca. 300 KB). Eine Flash-Simulation mit Einblick in den Mechanismus gibt es bei ►tang-ram. Eine Bauanleitung für ein Fischertechnik-Modell finden Sie hier. When the monkey’s feet are set to the point at two numbers, its fingers will locate their product. It teaches the complete multiplication table. It teaches the complete division table. It can add, subtract, multiply, divide, or factor elementary numbers. It is accompanied by an entertaining and instructive game for children. It is classic in the toy line. A device which interests both young and old. 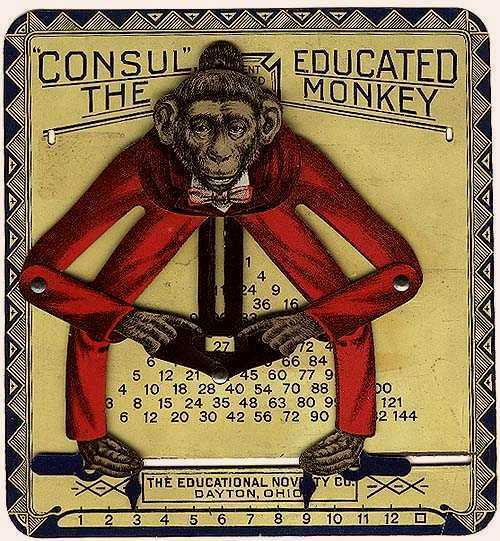 To multiply, adjust each of the monkey’s feet to point directly to a number. The monkey’s fingers will then locate the product of the two numbers. To multiply a number by itself, see one foot to point at the number and the other at the □. To add, insert the addition card between the monkey and the plate and carefully locate it in proper position. Secure it to the plate by the paper fasteners; or, if these are not at hand, the card can be neatly tied to the plate by passing a band of red twine through the card and through the small slots in the plate and tying in the rear. Further directions are on the back of addition card. It makes no difference to the monkey whether children are bright or stupid. He never loses patience at having to answer their questions. The Educational Toy Manufacturing Co. Brain power is increased by mental exercises. Turning work into play enables children to take the necessary exercises. The game Multe can be used to turn certain kinds of work into play. The mechanism of the Educated Monkey device is well adapted for use in playing games. It gives a chance to ingenious persons to invent a variety of games. It offers teachers an opportunity to develop a fine art in teaching children numerical tables and stimulating even the dullest to their best. The game Multe is played as follows: Several Slips of paper ruled as shown below, should be prepared. In each of the upper ten spaces there should be written a pair of number, each number being not greater than 12. The slips are placed in a hat or box. Each contestant draws out a slip and selects a product for each pair of numbers and writes the selection on the slip, one product under each pair of numbers. In making these selections, beginners may be allowed to look at the monkey chart, but mot to operate the monkey. When finished, each slip may be considered as ten questions and ten answers. An umpire is elected by the players. The umpire takes a finished slip and calls out the first question and its answer. Each player who is in doubt as to whether the answer is correct is allowed to consult his monkey. If the answer is correct, then the next answer is checked. Whenever an incorrect answer is found, the umpire cuts with scissors one space from the end of that portion of the slip which has already been checked. At the end of the game the player having the longest slip remaining is declared the winner of the game. If each player saves their used slips and pastes them together end to end, then after a certain number of games, the contestants with the longest roll of slips is declared champion, for the day, or the week, as the case may be. If the game is played by a class at school, the class should be divided into groups, the members of which are about equally matched in order that no one may become discouraged. Beginners who know nothing of the table should be told to select their products at random. Enough slips to last for several games can be prepared in advance. Sample slip is shown here. Push stem of a T-shaped Paper fastener through here and through corresponding slots in plate, or fasten to plate by passing a band if red twine through card and slots and tying in rear. To divide: Adjust the number so that one foot points at divisor and the fingers point at the dividend. The other foot will be found pointing at the quotient. To factor: Make fingers point at a product. The feet will point out its factors. To add: Insert the addition table under monkey and secure in proper position. Then proceed the same as directed for multiplication. The monkey fingers will point out sum of two numbers instead of their product. To subtract: Adjust the monkey so that one foot points at the subtrahend and the fingers point at the minuend. The other foot will be found pointing at the difference. Note: If the feet stick at any position, do not force their movement, but loosen by moving the arms. The diagram represents lines connecting the pivot points of the monkey. The angles ADE and EFB are equal and constant and the lines DE, DC, DA, EF, CF and FB are equal to each other in length. Prove geometrically that when the Point A is held stationary and the point B moved along a fixed line AB, the path of the point C is a straight line. Determine its direction.